Unprecedented innovation in technology and medical processes is rapidly revolutionizing human life. Current health systems, however, have not been able to adapt quickly enough to meet the needs of patients. This is particularly true for neuropsychiatric disorders or « brain disorders », and particularly challenging for policy makers. Value-based healthcare is currently gaining traction in Europe as the desired solution or path forward in improving health systems. 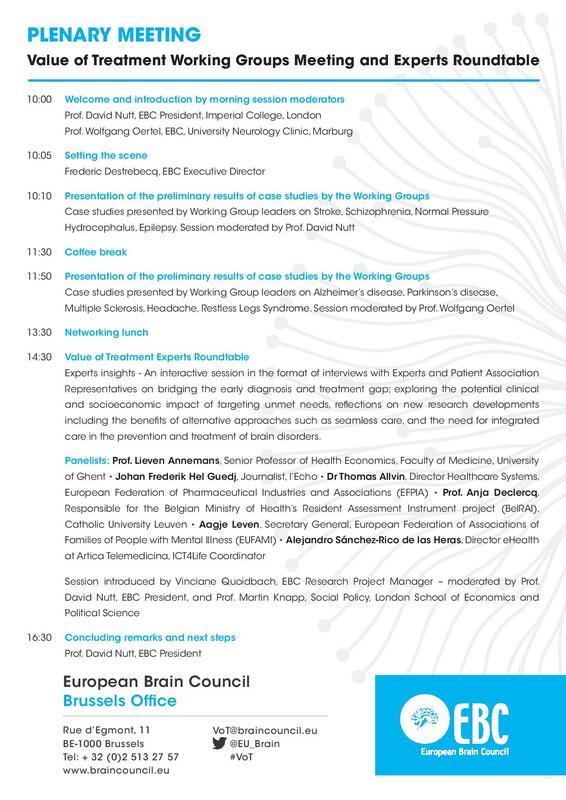 Within the context of our new research 2016-2017 study on the « Value of Treatment : Bridging the Early Diagnosis and Treatment Gap for Brain Disorders », we would like to invite you on the 18th of January 2017 to our forthcoming European Brain Council (EBC) Value of Treatment Plenary Working Groups Meeting with Partners and External Experts. See the official plenary meeting agenda below the registration form and view the outline HERE.